Has your username or password has ever been hacked? Would you recognise a rogue email? Do you know what a ransomware attack is? 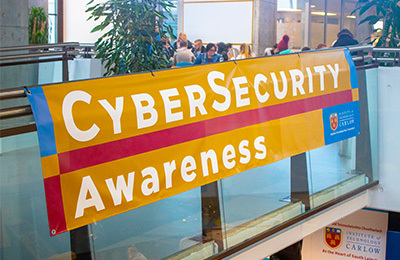 These questions, and many more, will be answered and explained today at the Cyber Awareness Morning taking place at the Institute and organised by the Computing Services Department in conjunction with cyber security staff and students. The Cyber Awareness Morning aims to raise awareness amongst staff and students of the ever-present and ever-increasing risks of cyber-attacks that all users of IT systems are exposed to, and to provide simple tips on how to greatly reduce one’s chance of being impacted by a cyber-attack. Stands erected in the Central Services Building will be manned by staff members who will provide live demonstrations of a successful ransomware attack, how to check if your username or password has ever been hacked and how to encrypt a USB key, amongst others. There will also be a technical demonstration on an advanced hacking method for replacing legitimate websites with fake ones that look the same but capture unsuspecting users’ data. A series of talks will take place in L114 from 11am. They include topics such as: keeping your passwords sage; recognising rogue emails and GDPR compliance. Staff and students may participate in an online quiz on information and cyber security and opt to be entered into a draw for an iPad. A representative from global cybersecurity software and services company Symantec will talk through a day in the life of a Threat Analysis Engineer while Ronan Coady, Head of ICT at Teagasc will discuss the company’s road to GDPR compliance.